If you're worried that your hard disk is on the verge of a breakdown, you'll want to check out Ashampoo HDD Control ($25, 10-day free trial). It constantly monitors your hard disk to check its health, looking for issues such as overheating, bad data being written, and possible mechanical problems. Then it warns you, so that you can back up your hard disk, and possibly buy a new one. Ashampoo HDD Control monitors the health of your hard disk, and warns you if there are any potential problems. 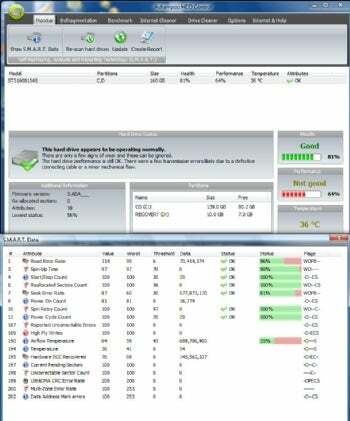 In addition to checking your hard disk's health, Ashampoo HDD Control gives you several useful disk tools, including defragmenting your hard disk and cleaning your hard disk of unnecessary files and Internet traces. These tools, by themselves, aren't particularly noteworthy, because there are plenty of free programs that do as good or a better job of it. Still, having them there means you have them all in one place. Ashampoo HDD Control's main screen summarizes the state of your hard disk, including its overall health and its performance. It will even tell you if your hard disk is healthy, but beginning to show signs of wear and tear. For those who live for technical details, Ashampoo HDD Control also shows you an enormous amount of data if you have a hard disk that adheres to the S.M.A.R.T. (Self-Monitoring, Analysis, and Reporting Technology) standard for hard disks. Most newer hard disks do. Click "Show S.M.A.R.T. Data," and you'll get statistics on just about every aspect of your hard disk, including not just the basics such as temperature, error rates, and spin-up time, but more esoteric information such as the multi-zone error rate and data address mark errors. Don't expect much help here--if you want to understand all this, you're on your own. At $25 the program isn't cheap. But if you're worried about the state of your hard disk, it may well be worth the price. If you don't want to spend the money, you can give HDD Health a try. It's free, and it uses S.M.A.R.T. to monitor your hard disk, although it doesn't offer as many advanced features as Ashampoo HDD Control. Note: The trial starts as a 10-day trial. It can be extended to a 30-day trial by registering the software.